Last month featured a brief history of the Michigan Nature Association, a pioneering statewide preservation group that grew from the ambition of a local woman and the generosity of many volunteers and donors since its beginnings in Macomb County back in 1951. The MNA has since acquired 160 nature sanctuaries on over 8,000 acres in 53 counties across Michigan to preserve rare species, habitats, and unique landscapes. For 50 years, MNA was based in Macomb and Saint Clair Counties, acquiring its first nature sanctuaries here in the early 1960s. MNA now has 18 sanctuaries in the Thumb. It is not possible to describe MNA without describing its founder, Bertha Daubendiek . Now 88, Bertha was the defining force and major benefactor of MNA for half a century. She served as “Executive Secretary” until her retirement in 2001 and was a trustee until this year. From 1988 until 2002, Bertha's home in Kenockee Township, Saint Clair County, was MNA's statewide office. The mailing address was Avoca, of all places. Bertha Antonie Daubendiek was born on a homestead in northeastern Montana where the land was usually too dry for a good wheat crop. Her family later moved to a farm in southwestern Iowa . Bertha recalls spending many hours cooking for her eight brothers who wanted only pancakes until one day when she made caramel bread pudding, and then they only wanted that. Bertha recalls her father pointing out birds near their home and showing her a map of his travels, especially to the upper peninsula of Michigan . Bertha's mother gathered buffaloberries out on the coulees in Montana, valleys carved out by ancient glacial floods. Her mother was a “fisherwoman who loved the wild places”. 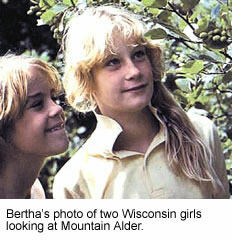 Later, during annual vacations to Michigan, her mother would walk with Bertha everywhere on MNA lands. After receiving a B.A. in Business Administration from Grinnell College in Iowa, Bertha came to Michigan . Here, she was secretary to the president of the Economic Club of Detroit, and secretary to State Supreme Court Justice Neil E. Reid. She also worked as a court reporter in Detroit, Mount Clemens , and Saginaw . Many of MNA's documents are in Gregg Shorthand, with meticulously recorded details. Bertha says she does not recall feeling any particular love for nature until she was in her 40s. She bought a summer cottage on Lake Huron near Lexington . One day she saw a red bird feeding in her trash burner. This prompted her to buy a bird book to identify it. She later organized the bird watching group in Macomb County that became MNA. Over the years, Bertha gained a reputation as an outspoken, demanding, and exacting leader, a quality that certainly benefited all of us in the form of rare natural treasures preserved across Michigan . Although I grew up in Saint Clair County, it was not until 1984 while attending MSU and working as a program assistant with The Nature Conservancy in East Lansing, that I learned about Bertha and MNA. I worked with Wendy O'Neil, a delightfully enthusiastic young woman dedicated to nature preservation. Sadly, I was told of Wendy's death from cancer a few years ago. Wendy was on the phone one day, and at some point she just smiled and said, “Yes Bertha ... Yes Bertha ... OK Bertha ... Goodbye Bertha”. I asked, “Who was that? ”. With her characteristic mirth, Wendy fondly explained MNA and its leader, having just been lectured by Bertha. While Bertha is known for her commanding personality, she has always had a softer side. First of all, she has given much of her personal fortune to the people of Michigan as MNA sanctuaries. Secondly, her leadership of MNA always emphasized the individual, and in many ways, she gave free-reign to anyone willing to help. 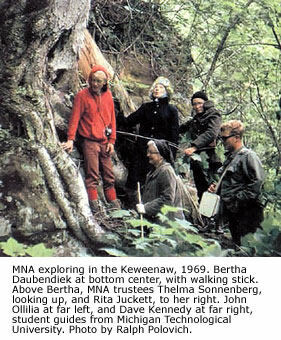 In MNA publications like “ In Retrospect ”, a hardcover reflection on the accomplishments of MNA published in 1988, and the “ Nature Sanctuary Guidebook, 7 th Edition ”, published in 1994, the photographs, many of which were taken by Bertha, focus on the individual's experience in nature. There are not just plants, animals, and landscapes, but intimate scenes of people in nature. There is a sense that the common person's interaction with nature is just as important as the academic's. It seems that the person on the other side of the camera really cared about the subject. To some extent, this was a product of several great photographers working for MNA, but also seems to reflect Bertha's love for people. As if her accomplishments in Michigan were not enough, Bertha has even been working to preserve prairie land in her native Iowa . Bertha Daubendiek brought part of the West with her to Michigan, a mountain range of strength, great plains of vision, coulees of fascination, the self-reliance of a pioneer, and for anyone that really knows her, a prairie full of charm. If there is ever an election for Mother Nature of Michigan, my vote is for Bertha. This article focuses on Bertha Daubendiek, but it would not be fair to leave out other people that have been a part of MNA. There are many across Michigan , and in a future article I will highlight several local individuals, past and present. For more information about the Michigan Nature Association, visit their web site at www.michigannature.org or contact MNA at 326 East Grand River Avenue, Williamston, Michigan 48895, phone: 517-655-5655, e-mail -- michigannature@michigannature.org.